The Feb. 5, 1931, editorial, “A cultural program,” in the Jewish Western Bulletin laid out some of the hopes, dreams and challenges to the beginnings of organized arts and cultural programming in the Jewish community of Vancouver. In many ways, today’s challenges echo the challenges of 84 years ago: arts and culture requires participation and support. They also require belief; belief that they form the bedrock of any healthy, sustainable community and are a way to celebrate and connect to the past while envisioning a brighter future. The JI spoke with the directors of five mainstays of the local Jewish arts and culture scene in 2015 – the Cherie Smith JCC Jewish Book Festival, Chutzpah!, the Sidney and Gertrude Zack Gallery, the Vancouver Film Centre and the Vancouver Jewish Folk Choir – and asked them the same five questions. Their responses follow. 1. Could you give a brief history of your organization? 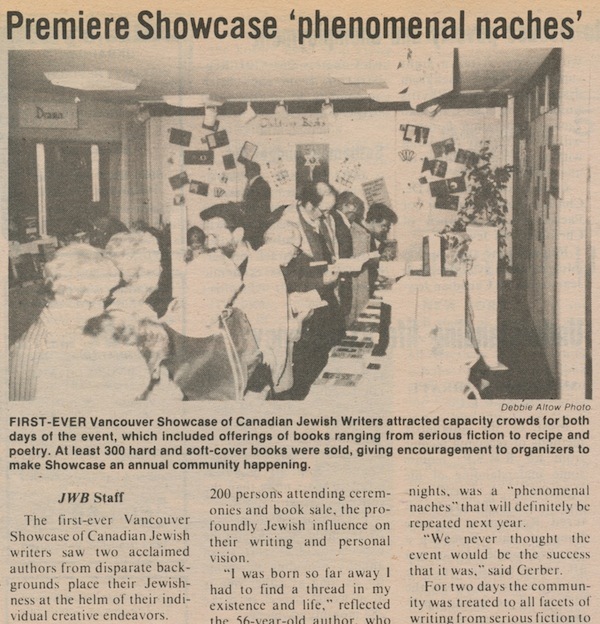 The JCC Jewish Book Festival (JBF) was founded in 1984 by a small group of book club friends led by Vancouver writer and publisher Cherie Smith. The group decided to create a forum to showcase Jewish writers to Vancouver audiences. After Cherie passed away, the Smith and Rothstein families established an endowment fund in her honor to support the festival in perpetuity and placed it under the stewardship of the Jewish Community Centre of Greater Vancouver. The first book festival, Jewish Western Bulletin, May 1984. The JBF – which celebrates its 31st year this November – has grown into a literary event of some magnitude, featuring award-winning international authors, showcasing Canadian writers, supporting local authors and publishers, and encouraging a love of reading across all generations. Despite its exponential growth, the JBF has not lost sight of its original core values and mission. The mostly volunteer-led operation echoes the passion of its original founders, many of whom continue to attend and support festival events to this day. 2. When did you become involved with it and what drew you to it? I have always been an avid reader and, at a very young age, I recall making a solemn declaration to my classmates that “books are my best friends.” To this day, you’ll never find me without a book in my bag to keep me company wherever I may be. When the position of festival director presented itself in 2008, it was the perfect opportunity to marry my professional experience in management and production with my passion for reading and writing. Equally important, the part-time hours of the position allowed me to have the time I wanted to be with my young children. 3. What are some of the ways in which your organization has contributed to the community over the years? ie. Why is it important for the community to have/support? As bearers of the auspicious moniker “The People of the Book,” it is hardly surprising that literature plays such a significant role in the Jewish community, and our Vancouver Jewish community has shown itself to be more erudite than many in North America. The Vancouver JBF is on an equal footing in terms of participating authors, events, duration and audience as festivals from much larger Jewish communities, including Atlanta, Houston and San Diego. Further, the Vancouver JBF far exceeds other Jewish book festivals in Canada such as Toronto, Winnipeg and Calgary in its scope, outreach and operations. This is testimony to our community’s passion for literature and learning, and the arts. 4. What are some of the challenges in keeping it going? Are there specific ways in which community members could help with those challenges? The book publishing world has gone though unprecedented change and upheaval in recent years. Increasingly, sophisticated technologies that introduced us to tablets, smartphones and e-readers have taken a heavy toll on the simple pleasure of reading a book. In this new age of shortened attention spans and 140-character communication, fewer and fewer people are making the time and applying the focus required to read a book. This is evident not least in the closure of countless bookstores and the bankruptcy of many publishing houses. One of our most important challenges at the JBF is to keep books and reading relevant not only to our current society but to generations to come. The JBF has adapted to these changing circumstances in order to remain current and vital. Examples include collaborating with Chapters/Indigo to introduce e-readers to our bookstore, changing the scope of the bookstore’s inventory, creating new programs that incorporate digital technology. The JBF also incorporated emerging technologies to showcase international authors: for example, Etgar Keret, whose opening night gala interview was presented via international video-conferencing. Of course, other important issues such as budget constraints have a detrimental effect not only on the JBF but on many arts and culture organizations. In times of economic uncertainty, arts organizations often bear the brunt of decreased funding, as both government and private sector funding is impacted. At the JBF, we are very blessed to be supported by a loyal and strong donor support base who recognize the crucial role literacy and literature plays in our society. This generous base has helped to keep the JBF sustainable. 5. What are some of the benefits, in your opinion, of the arts in general and why it’s important to have arts and culture in one’s life? Without the magic of art and culture in our lives, the world would be a drab and dreary place, indeed. Though misquoted, the great bard, William Shakespeare, declared that “music is the spice of life,” and he was right – though certainly his reference was to all of the arts. Reading a good book opens our minds to new worlds, feeds our souls, impacts us in the way that little else can. The Norman and Annette Rothstein Theatre (NRT), housed in the Jewish Community Centre, is a professionally equipped 318-seat performing arts proscenium theatre. It was established to enhance the cultural life of both the Jewish and general communities and is one of the Lower Mainland’s few mid-size proscenium theatres. The annual Chutzpah! Festival, Chutzpah!’s Creation Residencies, workshops for urban and rural youth and young adults program and Chutzpah!PLUS are our main professional programming activities. Part of an ad in the JWB, February 2001. Current Chutzpah! Festival director Mary-Louise Albert is the dancer featured. The Chutzpah! Festival, established in 2001 and named in honor of the late Lisa Nemetz, is one of the most respected international festivals in B.C. and Canada. Chutzpah! is known for presenting world and Canadian premières; supporting the creation of new work by way of multi-week dance residencies in the NRT with confirmed presentation of the residency work; and 2015 brought satellite dance festival residencies, youth workshops and performances to the North Island region of B.C., an exciting area of program growth and outreach. My first involvement in the Chutzpah! 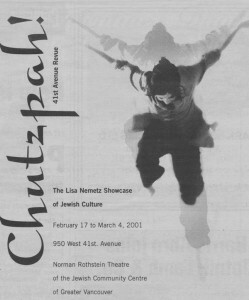 Festival was performing in the very first Chutzpah! in 2001. The founding artistic director of the festival, Brenda Leadlay, also put me on the poster. I was a professional dancer for over 17 years, and, after my second child was born, I left company life and freelanced as an independent dancer doing project and solo work, mainly. My company years had been with Anna Wyman Dance Theatre, Karen Jamieson Dance Company, Judith Marcuse Dance Company and apprenticing with Les Grands Ballet Canadian. My show in the inaugural Chutzpah! Festival was a shared evening with Toronto’s Kaeja d’Dance. Shortly after this performance, I transitioned out of dance and studied arts management and business administration at Capilano University and BCIT. About a year after graduating from BCIT with a post-diploma of technology in business administration, the JCC hired me as the artistic managing director. My first Chutzpah! Festival as the AMD was the 2005 one, and I will never forget the fun photo shoot with Boris Sichon as the photographer snapped (I’m revealing my age) away for that year’s perfect poster image. For the past 10 years, Chutzpah! has been programming Israeli artists to the point where they make up the most numbers of our international artists. The importance of connecting Israeli artists to B.C. (and in most cases to Canada for the first time) helps develop an understanding of Israeli culture and the amazing complexities of its arts. The exciting and entertaining multifaceted ways the performing arts accomplishes this understanding of Israel is a mainstay of the festival. No other festival in Canada programs the range or number of artists from Israel as we do. We have brought known artists and large groups such as Batsheva Dance Company, Kibbutz Contemporary Dance Company, Balkan Beat Box and the Idan Raichel Project, which we have presented in progressively larger productions. Many of our Israeli artists have been unknown to Canadian audiences, but we have still given these eclectic talented performers the opportunity to tour internationally, such as with Idan Sharabi and Dancers, Zvuloon Dub System, giving Yemen Blues and Maria Kong their first North American shows, Ish Theatre, Dudu Tassa, Itamar Boracov, Uri Gurvich and many more. These artists perform in our home, the JCC, in the Rothstein Theatre, as well as off site and out into the general community. It is a sharing of Jewish arts and culture with the Jewish and general communities. The Lower Mainland Jewish community is integral in helping us with this and the loyalty of the Jewish community and its willingness to take a chance with artists they don’t know is so appreciated and keeps us going. When I looked out into the audience of our Chutzpah!PLUS concert with Ester Rada at the Imperial this year, my heart melted as I saw so many familiar faces. We can’t do what we do without this support. Another area we are proud of is our commitment to programming world premières by B.C. artists, as well as our multi-week Creation Residencies. Supporting artists this way is paramount to artistic growth. This past year alone saw three world premières by B.C. artists and the year before we had three, as well. One of the biggest challenges is that with a festival the size of Chutzpah!, most artists (and, in particular, international artists) have to be programmed and committed to before most granting and donation revenue is secured, often one or two years in advance. Maintaining and increasing corporate and donor sponsorship is important to the sustainability of the festival. We have yearly support for our programming from government funders, such as Canada Council for the Arts and Canadian Heritage. A challenge is that we are a Canadian festival that programs many artists from another country, Israel. We are very grateful for annual support from the Jewish Federation of Greater Vancouver and the Israel Consulate, for instance, who help us with expenses relating specifically to our Israeli programming, as they know how important our Israeli programming is to the community. And … the community helps us so much by attending shows! The arts engage on multiple levels, such as opening up new dimensions and developing creative expression as a stimulus for spiritual and ethical understanding. Exposure to the performing arts allows for the nurturing of inventiveness as a tool to develop self-discipline, self-motivation and self-esteem. Participating in artistic activities helps to gain the tools necessary for understanding the human experience, adapting to and respecting others’ ways of working and thinking, developing creative problem-solving skills, and communicating thoughts and ideas in a variety of ways. The strength of Jewish arts and culture embraces and promotes the blossoming of divergent forms and points of view, and shares it with audiences from diverse communities. Many Jewish artists connect us to the differing aspects of the Jewish Diaspora. Exploring beautiful tensions and contradictions in these juxtaposed, but parallel, experiences helps feed a rich and engaging life. The gallery began as the Shalom Gallery in the Jewish Community Centre; the then size of the gallery was 19’ by 40’ (760 square feet). The current size is 22’ by 40’, with excellent lighting and a high ceiling with skylights. 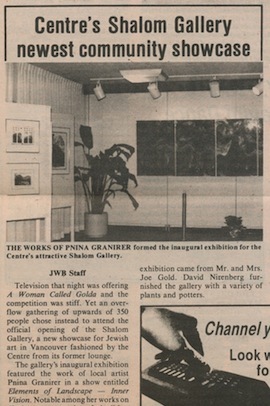 The Zack Gallery started life as the Shalom Gallery, JWB, May 1982. In 1988, the gallery received a donation from the Sid and Gertie Zack family, and the gallery was renamed the Sidney and Gertrude Zack Gallery of the Jewish Community Centre of Greater Vancouver. At that time, the gallery was designed as part of the overall Phase II renovation project of the JCC. The gallery has as goals: to create and promote a gallery of stature in which only high-calibre artwork (in all media) is shown, featuring artists of local, national and international reputation; to encourage the serious Jewish artist; to promote understanding of contemporary artistic concerns; and to participate in multi-cultural events. I have been an art dealer with a gallery presence in Vancouver for 30 years. It was time for me to make a change in my life, to have less responsibility and to become more a part of the community. 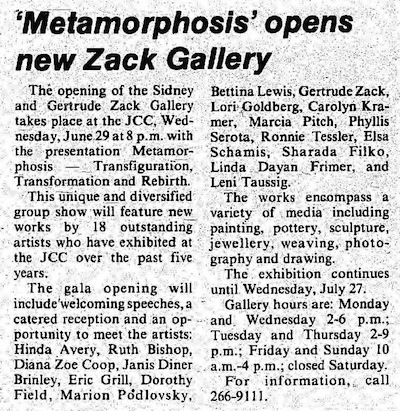 At one time, I was a board member of the JCC and I was on the Zack Gallery committee for many years, as well, so I have always been drawn to the JCC and the gallery. As you can well imagine, I am very comfortable running the gallery, dealing with artists, having openings, etc. 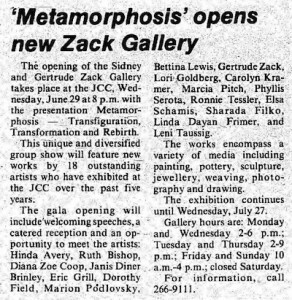 The Zack Gallery opened with a group show, JWB, June 1988. The Zack Gallery has supported Jewish artists for many years. There have been shows that relate specifically to Jewish and or Israeli themes, as well as shows by Israeli artists. The gallery is a venue for Jewish artists who are not necessarily mainstream to show their work. It is unique in the city. It is important to support the gallery, as arts and culture are a huge part of the glue that holds the community together. Artists are always underfunded/underpaid. Part of the cost of having a show falls upon the artist. Funding is always a challenge. Community support would be wonderful. I would be happy if more people supported the gallery by coming to the many openings, talks, poetry readings, etc. That would be very satisfying. As I stated, arts and culture are community glue. They bring together artist and patron, student and teacher, ideas and realization. Creativity is what is left when there is nothing else. Jewish films were first brought to Vancouver [by what is now known as the Vancouver Jewish Film Centre] under the umbrella of the Jewish Festival of the Arts, a community organization that was founded in May 1984. Films were sought out that showcased the diversity of Jewish culture, heritage and identity. In 1988, the Festival of the Arts morphed into the Vancouver Jewish Film Festival and, as demand from community organizations for Jewish film grew beyond an annual festival, the name was changed in 2013 to the Vancouver Jewish Film Centre to better reflect the breadth of offerings presented year round. In 2009, I was approached by the CEO of Jewish Federation and asked to take a meeting with the executive committee of the board of directors of the Vancouver Jewish Film Festival. The board was conducting a search for a new executive director. 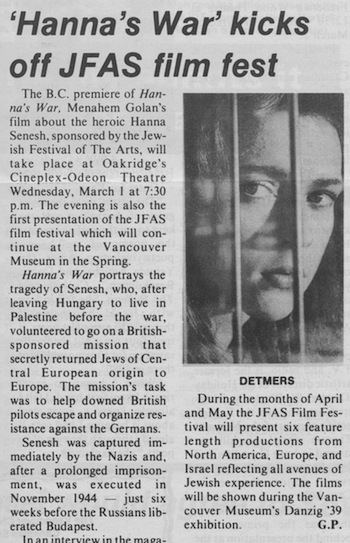 The Jewish Film Centre developed out of the Jewish Festival of the Arts Society, JWB, February 1989. At the time, I had held the position of director of exhibitions for the Vancouver International Film Festival for the previous 10 years. I had also been a general manager for Cineplex Entertainment. I was a successful photographer with a background in film-set photography and had previously been the managing director of Montreal’s premier repertory cinema. The offer from the board of the Jewish Film Festival would allow me to bring to the organization 30 years of professional experience in all aspects of the film industry. In addition to the executive director position, I would also be their artistic director. The opportunity to make a difference, to contribute to the arts in our community was the “icing” on a long career in the film business. The added opportunity to grow the organization was a challenge I was eager to undertake. 3. What are some of the ways in which your organization has contributed to the community over the years? The film centre has held an annual Vancouver Jewish Film Festival for 27 years; it is the longest-running Jewish film festival in Canada. We have engaged our community by bringing the best quality films that inspire, entertain, educate and connect us to the diversity of Jewish culture. The Vancouver Jewish Film Centre was founded to preserve and showcase our Jewish culture, heritage, identity, and we reach all members of the community. Our annual film festival is presented in a mainstream cinema, a secular environment, and is open to all who want to attend. It is a major social event that brings the community together. Film is the most reasonably priced form of cultural entertainment available today. Film accesses and engages the broadest community. We are deeply committed to outreach and we work tirelessly with community organizations to bring films to their stakeholders. Generally speaking, the film centre is an organization with the potential to reach the whole Jewish community. It’s Jewish continuity through storytelling in today’s visually oriented world. The film exhibition industry has changed dramatically in just a few short years. Everything is now digital, and the technology required for state-of-the-art presentation is very expensive. Film costs and venue rentals have risen through the roof; movie theatres with the proper screening equipment are in short supply. In spite of all of this, we have responded to the increased demand for more film presentations from our greater Jewish community. We travel to community organizations with projector and screen in hand to bring the films directly to them. We are co-presenting Victoria’s first Jewish film festival this November. We are facilitating film with the Okanagan Jewish community. We’ve facilitated numerous fundraising film events throughout the community for Jewish organizations of all kinds. All of the above means increased costs for us at the same time that our community in general is faced with aging infrastructures with large capital campaigns in place. That often means cultural entities are left struggling to attract funding from the community, funding required to keep us vibrant and relevant. Our attendance has been growing year over year and is a direct result of the quality of both the films and the presentations. However, since relocating the annual film festival to the Fifth Avenue multiplex cinema we’ve seen a number of community members walk by our screenings to attend a “Hollywood” film in the next auditorium. The most obvious way to help is to attend the films we present; the old mindset of what constitutes a Jewish film no longer applies. The films we present are world class and just as good, if not better, than any other film showing in that multiplex today. We always welcome more help from volunteers. Assisting us to bring our offerings to the community is a real way a community member can help. Finally, we are soon launching our first-ever endowment campaign with matching funds from dedicated donors. We hope and trust the rest of our community will support this effort. There is a mountain of documentation from researchers all over the world about the benefits of having art and culture in one’s life. In my opinion, in the case of the Jewish Film Centre, we bring people together. Film opens a dialogue where none may have existed before. It can fill us with pride, self-esteem; it can literally break down barriers by allowing us to experience the life of the other. Film can help foster a sense of belonging and pride within a community. Film can preserve a collective memory and foster a continuing dialogue about the past. The Vancouver Jewish Film Centre exists for this, we convene an inclusive community that celebrates, educates, entertains and inspires through thought-provoking films. We present the stories about the many diverse aspects of Jewish life. We aspire to be a cultural organ of the Jewish community in Vancouver, in British Columbia, and to act as a repository of culture for future generations. The Vancouver Jewish Folk Choir of the Peretz Centre for Secular Jewish Culture was founded in 1980 by conductor/arranger/ composer Searle Friedman with the aim of keeping Jewish music alive and educating both Jewish and non-Jewish audiences to a world cultural treasure. The choir has about 25 members, both adults and seniors, and at present performs between eight and 10 times per year, both at the Peretz Centre and at venues within and outside of the Jewish community. 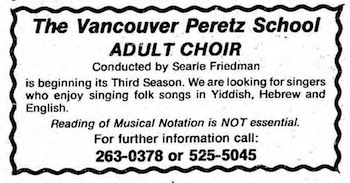 Vancouver Jewish Folk Choir third season ad in the JWB. In the late 1990s, I was looking for a choir to join, and found the Vancouver Jewish Folk Choir. I was excited to be singing in Yiddish, which I grew up surrounded by, and pretty quickly felt very at ease with the other choir members. The older people reminded me of the grandparents I lived with growing up in a Jewish community in Brooklyn; politically, and in many other ways, I was very culturally comfortable in the choir. And it gives me great pleasure to be singing in the language of my ancestors – I feel I am honoring them with my music. And I love the beautiful minor mode of so much of the repertoire. Both Friedman and Millard have arranged traditional and contemporary Yiddish music (and other Jewish music) for choir. Over the years, the choir has focused more and more on Yiddish, and exposed audiences to a wide variety of songs in that language, as well as major works by Srul Irving Glick, Mordecai Gebirtig, Max Helfman and others. • In addition to regular performances at the Peretz Centre, which include holiday celebrations and an annual major concert, the choir also performs a Chanukah concert annually at two seniors homes – the Louis Brier and South Granville Park Lodge. In the last few years, the choir has also performed its Pesach repertoire at the Louis Brier. We hear from the people who work with the residents at both venues that many people who are very cognitively impaired in other areas can still relate to music, and people who can no longer speak are still able to sing. The joy we feel in the audience at the Louis Brier as we offer them songs both familiar and new is palpable. • The choir gives people who like to sing a chance to sing in some of the languages of our people – Yiddish, Hebrew, Ladino and English – and an opportunity to socialize with other people who also enjoy singing this music. Many of the people in the choir have no other connection to the Peretz Centre. • The choir has also performed at other venues, such as the Jewish Community Centre, the Richmond Seniors Centre, CityFest, VanDusen Festival of Lights, and the Federation of Russian Canadians. In this, we provide an outreach to the broader community, and expose wider audiences to Jewish music beyond modern Israeli or religious music or klezmer. The main challenge is cost. At present, the conductor, accompanist and three section leaders are paid on a weekly basis. We often have to hire additional voices for major concerts, as well. Two major ways that community members could help with those challenges: join the choir, and come to the concerts! Another way: write support letters that the choir can use in grant applications.